Please consult the photograph above for details of the food’s packaging, design and retail presentation. Additional images of the recalled Cake Mix products can be found on the Web site above. According to the FDA, Conagra Brands is collaborating with health officials in connection with a positive finding of Salmonella in a retail sample of Duncan Hines Classic White Cake Mix that may be linked to a Salmonella outbreak that is currently being investigated by CDC and FDA. Five occurrences of illnesses due to Salmonella are being researched by CDC and FDA as part of this investigation. Several of the sick individuals reported consuming a Cake Mix at some point prior to becoming ill, and some may have also consumed these products raw and not baked. Consumers are reminded not to consume any raw batter. In general, cake mixes and batter can be made with ingredients such as eggs or flour which can both carry risks of bacteria that are rendered harmless by baking, frying or boiling. Consumers are reminded to wash their hands, work surfaces, and utensils thoroughly after contact with raw batter products, to follow baking instructions, and to never eat raw batter. 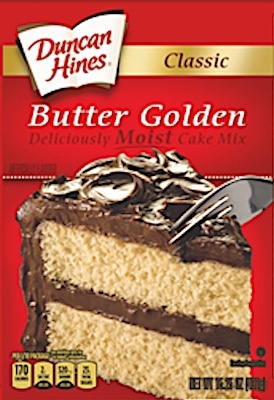 If you believe you have purchased or have in your possession any of the recalled Duncan Hines branded Cake Mixes, please do not consume them directly nor use them as an ingredient in another dish or preparation. Instead, return the Cake Mixes to the store where you purchased it for a full refund. ==> To see other recalls and notifications caused by contaminated, adulterated or mislabeled Cake Mix, please search for “cake mix” or more generically, “baked goods” using the Search Box at the top of this page. ==> To see other recalls and notifications for products manufactured, marketed and/or sold by Conagra Brands, please search for “Conagra” using the Search Box at the top of this page. ==> To see other recalls and notifications for products manufactured, marketed and/or sold under the Duncan Hines brand name, please search for “Duncan Hines” using the Search Box at the top of this page.